Well, I ordered the iPad 2 at 4am yesterday morning, but it was not going to arrive for more than a week, so I just went to my local Best Buy and was able to get the same model I had ordered in my hand today! (Online inventory reporting is a great thing!) Got the white, 64gb, WiFi & 3G, AT&T version. 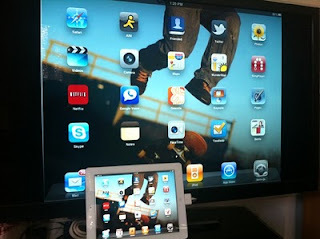 Craved the mirroring of the screen via the VGA dongle which makes training and showcasing apps oh-so-nice! I know, I could have jailbroken the old one, but did not want to go that route. The two cameras, one for Facetime and one for photos and video so I can now use all my cool iOS photography apps on the iPad. I can also take movies and dump them right into iMovie or ReelDirector on the iPad 2. I so wanted a white iPad. I was tired of the black-on-black color scheme. It is lighter, too, but it does not really seem that it is 15% lighter. The new cover, which I was not going to get, but did. Besides keeping the screen very clean, the ability to type on the slant and, more importantly, hold the folded back cover in your hand as you use the iPad, is a big plus. Plus the magnetic way it attaches and turns the device on and off is very neat! If you have any questions or want me to try some things out, please let me know!